Labor Day. YADILOH SDRAWKCAB EHT. In case you aren’t sure of the title… it’s Labor Day. The Backwards Holiday. Every year when it rolls around I wonder why it’s named Labor Day. Since it’s a Holiday intended to be just that, a Holiday – I would think a better name may be Relax Day or Lazy Day or Off Day or Sleep in Day, maybe even Do-Nothing Day, something other than Labor Day. After all, we know what Labor means. And many will likely be celebrating Labor Day by Laboring. In the 1830s, manufacturing workers were putting in 70-hour weeks on average. Sixty years later, in 1890, hours of work had dropped, although the average manufacturing worker still toiled in a factory 60 hours a week. These long working hours caused many union organizers to focus on winning a shorter eight-hour work day. They also focused on getting workers more days off, such as the Labor Day holiday, and reducing the workweek to just six days. These early organizers clearly won since the most recent data show that the average person working in manufacturing is employed for a bit over 40 hours a week and most people work only five days a week. Surprisingly, many politicians and business owners were actually in favor of giving workers more time off. That’s because workers who had no free time were not able to spend their wages on traveling, entertainment or dining out. As the U.S. economy expanded beyond farming and basic manufacturing in the late 1800s and early 1900s, it became important for businesses to find consumers interested in buying the products and services being produced in ever greater amounts. Shortening the work week was one way of turning the working class into the consuming class. So, to celebrate the month of September and the affection for Laboring, I have a special announcement to make: I will be Laboring, but for a very special reason. My team and I are addicted to helping you and those you know buy or sell the place they call home. In fact it’s a race to help as many as possible so we can GIVE more away. A CORE philosophy at our company is ‘the size of the hole you give thru is directly proportionate to the size of the hole you receive thru’. This is why our Mission is to Go Serve Big!!! Serve you, serve those you refer to us and of course, serve a very worthy cause… the great work being done at Texas Children’s Hospital. 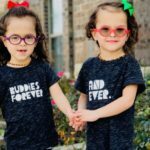 Through our Go Serve Big mission, we are on a mission to raise $10,000 for Texas Children’s Hospital by donating a portion of our income from home sales to them. As you know Texas Children’s Hospital does a tremendous job of helping kids fight through and survive nasty life-threatening diseases like Cancers, Leukemia and Non-Hodgkin’s lymphoma: stuff that many times rob the life right out of young people. They also lead the way in research and women’s health. Anyone you know considering buying or selling a home please refer them on over to my real estate sales team. Not only will they benefit from our award-winning service, but a very worthy cause will benefit as well. Simply call me direct at 832-721-0442 or forward my number on. P.S. Do you like stories? Everyone has one. The story of these young girls, enclosed is a really good one. Read with tissue handy. P.S.S. It’s easy to refer those you know considering buying or selling a home. Just call me at 832-721-0442 or pass on my number. During my second trimester, however, all was going well until it was not. Our world was flipped upside down at 23 weeks gestation. I remember this day so vividly, too. I was at work when I experienced some leakage – not a significant amount, but also not minimal. In tears, I called my husband who told me to drop everything and head to my OB/GYN. Our physician attempted to perform an emergency cerclage, planning to stitch my cervix closed to prevent early delivery. Sadly, one of our daughter’s membranes had ruptured (PPROM) and it was too late for the procedure. I was transferred to Texas Children’s Pavilion for Women and placed on bed rest. I decided to make the best of the situation and prayed fervently. I prayed for our girls to not experience distress, and I prayed for them to stay in my womb as long as possible. Each day, every ounce of growth would make a huge difference in their outcomes. The girls were placed on breathing ventilators and had lines placed all over their little bodies for medications. They underwent procedure after procedure, including multiple blood transfusions. We had to wait two long weeks before I could even hold Layla, and an excruciating month before holding Eva, as she was especially fragile with severely underdeveloped lungs. At 12 days old, Eva needed open-heart surgery to close a heart murmur. Her recovery was slow, and she spent a total of 10 weeks on the ventilator. Life in the NICU changes you, forever. We were elated when we finally got to take our girls home. Our family was together, and I could breathe easy. Eva came home on oxygen support, which was removed 5 months later. 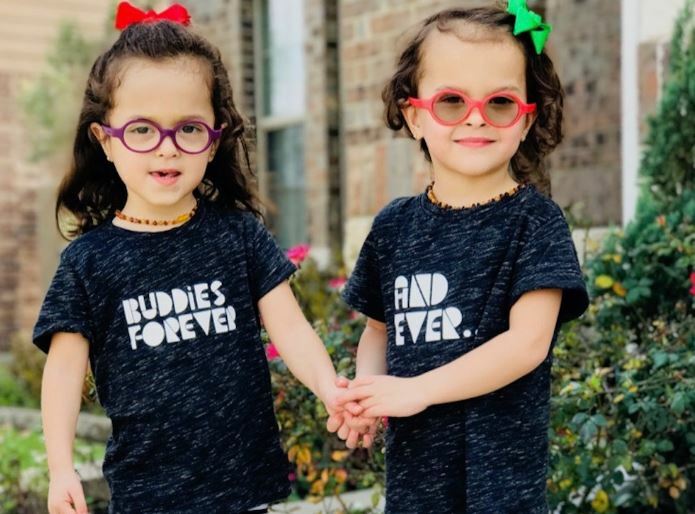 Both girls received early intervention therapy through Texas Children’s to help them catch up with their peers, which they have. Eva and Layla are now healthy, happy and silly 4-year-old girls who are starting pre-kindergarten this fall. This is such a huge milestone we get to celebrate! Texas Children’s NICU taught us to cherish every moment and to treasure every accomplishment, as small as they may seem. It taught us that our family is resilient, and taught us that our daughters who entered this world as tiny preemies are fierce warriors. They have battle scars to prove it. We’re forever grateful for the compassionate, knowledgeable and extremely competent staff at Texas Children’s Hospital. We attribute love, prayer and expert medical hands as the reasons for their outcomes. If you ever find yourself doubting your ability to overcome any obstacle that life may have in store for you, I pray for you to remember how you entered this world with grit and a spirit of resilience that lit up the darkness. May that light always burn bright within you, my beautiful miracles.